Build it…and They Will Export! San Francisco’s economy is tourists, bankers, Craigslist and, of course, Twitter. Wrong spot to send a government export promoter looking for more Made in the USA material to help reach the President’s National Export goal of saving or creating some two million jobs by 2015. I’ve opted to stop in the services city by the bay en route to the annual Asia Pacific Business Outlook Conference held at the University of Southern California’s business school, where this year 180 US firms will come for updates on Asian markets and export tips, and to hear from Secretary Gary Locke. The Commercial Service, part of the International Trade Administration, an operating unit in Mr. Locke’s Department, assigned me to Hong Kong to work on behalf of U.S. companies and economic interests about three years ago. I’ll be joined at the conference by a dozen of my colleagues similarly positioned in other Asian capitals to do the same export enhancing work. This year I’ve opted to stop in San Francisco to meet with current and future U.S. exporters, in addition to those meeting us in LA for the seminars and one-on-one counseling sessions. 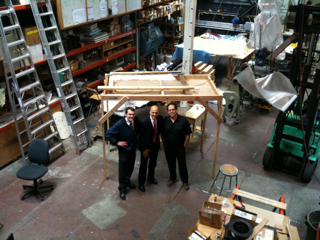 Left to right: Commercial Officer Douglas Wallace, Commercial Officer Andrew Wylegala, and Sculptor/Manufacturer, Capitano di Minuzie Nikolas Weinstein stand on the Weinstein Studios shop floor. I am standing in the middle of Nikolas Weinstein’s glass sculpture studio located improbably enough behind a Mission District laundromat. And I am trying to decide which is more shocking — the 30′ undulation of helix-shaped glass tubes of a work in progress, suspended above the furnace, forklift and flat-panel displays of this compact factory, or the discovery that precision manufacture on an industrial scale can still be carried out in San Francisco. Downtown San Francisco! We ARE talking export manufacture. The vast majority of Nick’s work is destined for grand residences and luxury hotels overseas, mostly in Asian cities such as Singapore and Shanghai. And we are talking BIG exports. I learn that — at over 250′ unfurled — the glass “fabric” of a work now soaring above the lobbies of a Shanghai luxury hotel (looking in the glossy photos like one of those Chinese acrobat’s ribbons) and comprised of some 35,000 hand-worked glass tubes, would not have fit in the 747 that brought me here from Hong Kong overnight. And we are talking innovation. To execute the unique forms of a Weinstein chandelier I now recall visiting at a Gehry-designed bank headquarters next to the re-constructed American Embassy in Berlin, Nick’s team even had to invent a special matrix bed for the in situ kiln. But Nick is explaining that it is not finding more projects in booming Asia, nor the glass- and mind-bending technical complexity of his shapes, nor even the delivery headaches of the fragile works that keep him up at night. It turns out that the chain of glass blowers, metal formers and ceramic suppliers needed to execute these fantasies in glass is nearly as long as some of his installations. And the nature of this work — one-off, site-specific projects whose execution requires endless iteration of tweak and turn — is such that relative proximity is a must. So this preview stop of my Business Outlook Conference tour reveals a snapshot as complex and organic as a Weinstein: the offering of conceived- and fabricated-in-the U.S. product remains as rich as ever, but the challenge of keeping U.S. production chains short enough that they remain linked is a daunting one. I am thinking that U.S. export growth can be part of the solution to this challenge, by providing Nick’s manufacturer partners with sufficient scale and income to stay in business and in Nick’s “neighborhood.” Should this prove to be the case, we will not only reach that National Export goal but also prove to the world that, “yeah, we DO still make stuff in the U.S.” The best stuff.